Recently as I went through my regular blog reads, I found this post over at Bake or Break for the cookies you see above. Oh. My. 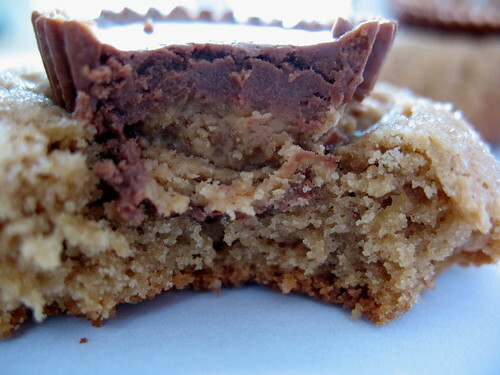 A moist, chewy peanut butter base, with a mini peanut butter cup pressed into the top where it becomes all melted and gooey? I'm SO in. These cookies are amazing. I love them so much that I often bake and give them to people. They are also a sturdy cookie, so fit well into a box for gift giving. Try passing some on at Christmas or in a care package. *I found that at this point it was too wet to try to shape into balls, so I set the bowl in the fridge for about 20 minutes and it worked fine. 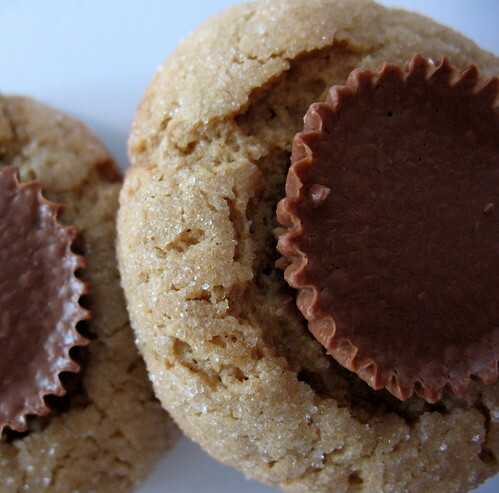 Allow to cool slightly before you remove them from the cookie sheet to a rack; and then enjoy with a glass of milk!